There is a scene in one of the (wholly unnecessary) Back to the Future sequels when Doc Brown appears in an 1800s-era steam locomotive upgraded with some significant aftermarket add-ons, specifically a flux capacitor and a hover kit. I was reminded of this scene as I beheld the brightly-lit LED display that replaced my 1979 Warrior's original mechanical attitude indicator on the instrument panel. It was clearly something that the designers of my airplane never envisioned. As exciting as the modification itself was, getting to that point was something of a journey unto itself. 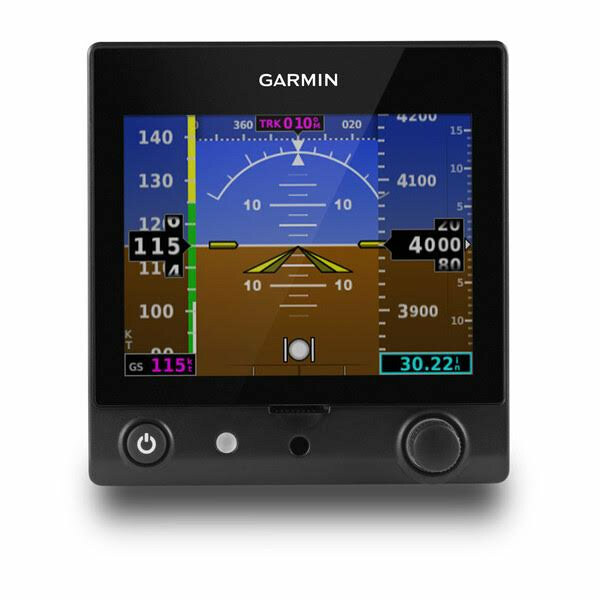 Garmin's G5 was recently certified to replace the primary attitude indicator (AI) in multiple aircraft, including mine. Certification occurred under the FAA's revised risk-based approval process, making the instrument available at a lower price point than would have been possible under the previous, onerous certification rules. To say that this device has made a splash in the aviation world is putting it mildly; Garmin has been unable to build them quickly enough to support demand. Why is this little box so popular? The AI (once called an "artificial horizon") is the primary instrument used to combat spatial disorientation in pilots flying in poor visibility. Traditionally, this information was provided by a mechanical gyroscope powered by a vacuum pump. As the bearings wear out in the gyro, the mechanism can fail. Additionally, the dry vacuum pumps predominantly found in light aircraft are notoriously prone to failure after a few hundred hours in service. Thus, this critical instrument has not one Achilles heel, but two. The G5, on the other hand, is entirely solid state. There are no rapidly spinning mechanical parts to wear and eventually fail. It is independent from the vacuum system and runs from ship's power. Although aircraft alternators can and do fail, the G5 includes a backup battery good for four hours. Based on this, it is anticipated that the G5 should be more reliable than the mechanical equipment it replaces. That is a wonderful thing from a safety perspective and the driving force behind the FAA's new certification paradigm. If the G5 is installed as the primary attitude indicator, the existing rate of turn indicator must be retained. If the G5 is installed as the rate of turn indicator, the existing primary attitude indicator must be retained. I waited nearly 3.5 months for my installation. This was complicated by the back-order at Garmin and the mass migration of avionics personnel from the shop I contracted to do the work to another. Once I followed the avionics folks to the new shop (Calspan at the Niagara Falls International Airport), my wait in Garmin's back-order queue started over again from zero. So, there was a lot of waiting. Eventually, I received word from Ben at Calspan that they were ready to do the install starting January 15th. With the waiting ended, surely the rest of the process would be smooth sailing, right? A shovel and a credit card were to prove instrumental in my avionics upgrade. Sunday night, January 14th, I drove to the airport to shovel snow away from my hangar door. Ed had agreed to follow me to Niagara Falls (KIAG) in one of the club planes (N1185X) the next morning. When I was done shoveling, I walked over to the open hangar where Eight Five X-Ray awaited her next flight. I found her plowed in behind a large snowbank and encrusted in ice from the previous Friday's freezing rain shower. Ice was nearly a centimeter thick in places on the wings and would be difficult to remove. Ed and I received permission to swap Eight Five X-Ray with another Cherokee parked in the club's single-bay heated maintenance hangar. I cleared all the snow from in front of the Archer and used a credit card to remove the ice stuck to the spinner to avoid vibration once the engine started. With me at the controls of One Delta Tango and Ed at the controls of Eight Five X-Ray, we swapped the airplanes and departed for the night hoping that the Archer would be adequately deiced by the next morning. When we arrived at the airport on the morning of January 15, the outside air temperature was -2°F. The Archer was well deiced, however, and the Warrior's engine was comfortably toasty after an evening spent with the preheater running. Ed in a thawed Eight Five X-Ray ready to depart runway 10 at Sodus. With eyes on oil pressure gauges and cruise RPM set a couple hundred revolutions lower than usual, both airplanes launched and powered through the thick, cold air. An eye-catching low cloud deck floated just above the water of Lake Ontario. It was my first flight to Niagara Falls International (airport #185). I had located Calspan's FBO building on the taxiway diagram and assumed that it was where I needed to go. However, as I surveyed the airport from the traffic pattern on the north side of the field, I saw an enormous hangar belonging to Calspan that was well east of the FBO. How did I know that it belonged to Calspan? Because it was so huge that I could read "Calspan" painted over the door from the traffic pattern. After seeing the other Calspan hangar, it was not clear to me where I needed to go. As I rolled out on 10L, Tower prompted me for parking. "Cherokee Four Eight One is going to the Calspan maintenance facility." That seemed like a safe response. "I've never heard of that. Are you going to the FBO ramp or the research ramp?" I didn't know which was appropriate and neither did the controller. We decided to try to the FBO ramp. "Taxi FBO ramp via Kilo, Charlie, Hotel, cross runway 24." Halfway down taxiway kilo, Tower called again. "It looks like you need to go to the research ramp. Taxi Kilo, Charlie, Delta, cross runway 24, hold short runway 28L." To his credit, he had actually contacted Calspan on the phone and asked them where to send me. 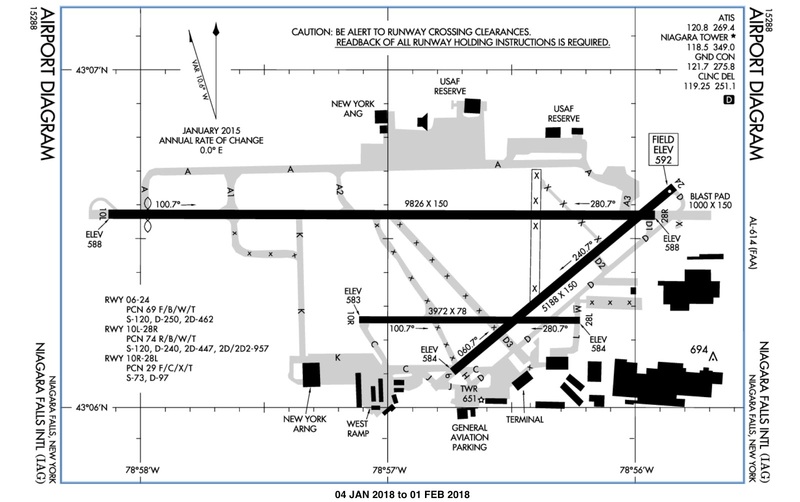 Once across runway 24, my taxi clearance was amended to "continue on Delta, cross runway 28L, right on Mike, cross runway 28L again, then Lima straight in to the ramp." After exploring the southern reaches of the airport, I shut down in front of the massive Calspan hangar on the research ramp. While I waited for Ed to arrive, I checked my email and saw an unread message from Ben sent shortly before we launched from Sodus. "You'll need to park on the research ramp, not the FBO ramp." It was great advice, but poor timing. Scale model of the Bell X-1 hanging in the Calspan Research lobby. The site was once home to Bell Aircraft and was the birthplace of the X-1, the rocket plane that carried Chuck Yeager through the sound barrier in 1947. In celebration of that legacy, a full size model of the X-1 hangs in the Calspan Research lobby. As Dennis explained, the site continues to focus on experimental aircraft research. Mainstream avionics work (like mine) was being done on the side to keep the staff busy as research work ebbed and flowed; a smart business model. I met Ben and Dennis and reunited with Brian, who installed my ADS-B system, audio panel, and GNS-430W while he was based in Batavia, NY. I departed confident that the Warrior was in good hands. After the drop-off, Ed whisked me back home in Eight Five X-Ray. Four days later, Dennis sent me a message with an image of the installed G5. The airplane would be ready for pickup the following Monday. Unfortunately, I and the state of New York were both under the weather that day. I had a runny nose and a pounding headache whereas the local area had a bad case of instrument meteorological conditions. I arranged to pick-up on Friday, January 26. This also happened to be my last day of work at the company I joined 2.5 years earlier. All aeronautical adventures happen against a backdrop of real life. To say the least, the week I retrieved the Warrior from Niagara Falls was a hectic one in real life. In addition to being sick at the beginning of the week, I was working long hours in an attempt to wrap up as much unfinished business as possible. I attended The Bear's very first band concert (conducted by Kristy) and we went to the Eastman Theater to see Broadway star Audra McDonald perform with the Rochester Philharmonic. Our second row seats were about fifteen feet from her; her vocals are amazing and she is absolutely stunning in person. On Friday, I handed off the last few incomplete tasks at work, enjoyed a celebration organized by my direct reports, and said my goodbyes while running a gauntlet of hugs. I arrived at the Williamson-Sodus Airport at 1:10 that afternoon and found Ed ready and waiting. He had generously agreed to tote me back to Niagara Falls in Eight Five X-Ray. This time, I knew where to go on the field at Niagara Falls. At Calspan, Dennis walked me through the finer points of the G5. It is a stone simple instrument, so this did not take long. Before I knew it, I was back in the air in trail behind Ed. Overall, I am pleased with the instrument. The attitude indicator is easily as crisp and responsive as the mechanical gyroscope ever was. The pitch scale is expanded such that it is easier to read precisely than the old Sigma-Tek mechanical AI ever was. The only flaws that I see are that the slip/skid ball seems a little less sensitive than the real thing, the airspeed displays a knot faster than my mechanical airspeed indicator, and the altitude reads ten feet low versus the mechanical altimeter. However, the G5 is not intended to be used as primary for any of those indications and, frankly, I prefer looking at needles over reading numbers. On the flight home, I learned how to set track and altitude bugs, which are a nice feature and simple to use. The display is far crisper than that of the Garmin 430W GPS, as apparent in the photograph above. I think the G5 is a great addition to the panel. Only time will tell if the instrument is as reliable as promised, but it is off to a great start. Not bad for something that is basically a square peg in a round hole. "Colder Than a Sensitive Part of a Sorceress' Anatomy".....that my friend will cost you a keyboard. I actually started to laugh while gulping down this mornings first cup of tea. After I finished hacking I muttered what's wrong with him. The G5 looks excellent in the panel! I appreciate the pirep, I'm thinking this will be a future upgrade in the Sundowner when my AI crosses over. I think the heading and altitude bug is a nice touch. Having the G5 package provides for a tighter, faster scan which is always a plus when it gets busy single pilot IFR. Great post, thanks for sharing. A lot of people were asking me for a pirep, so I hope the information is useful. I think the real test will be flying approaches with it. Hopefully I can try my hand at that sooner than later.